I struggle to find my place in this year of insurrection against the state sanctioned murders of young black men. My knees are too old to run from riot police, my lungs too scarred to survive teargas. I’m wrestling with what it means to be a 50-year-old black American woman who has inherited the benefits of civil rights advancement, and upon whose shoulders the next generations should safely and securely stand. And I am struggling with what it means to have failed. I have failed to properly name the extrajudicial killings of Sean Bell in 2006 and Trayvon Martin in 2012 and Jonathan Ferrell in 2013 and Eric Garner, John Crawford, Mike Brown and Darrien Hunt in 2014, and I have failed to stop their deaths. I wasn’t there bravely sewing letters on a banner to be dropped in protest that stitched past and present together: “a man was lynched today.” I have failed the memory of 41 bullets striking the body of Amadou Diallo in 1999; failed the decapitated body of James Byrd, dragged to death behind a truck, in 1989. Most of all, I have failed to be watchful and articulate after the revenge killing of Michael Donald in 1981, that moment which destroyed the private club of the Ku Klux Klan and left its role to be taken up by the state. I want to believe that I stand in solidarity with young activists in Ferguson, but their very existence indicts me. I am part of a generation that believed that black people needed “voice”. We invested in institutions that promised to advocate on our behalf and to win. Today, still receiving mail from these organizations, I wonder how can they claim success? Why aren’t they amplifying younger, more urgent, voices? Today’s young people need voice, but what they need more is power. Results matter. They are not optional or aspirational. Without results, people I love will continue to die. We social justice workers often emphasize careful attention to process, because just ends can only be achieved by just means. But just results also matter. We often emphasize cultivating relationships of solidarity and reciprocity, sometimes so emphatically it seems that “relationship” is all that matters. But results matter. Finishing the job of making it legal to be a young black man on a public street in the United States America, matters. 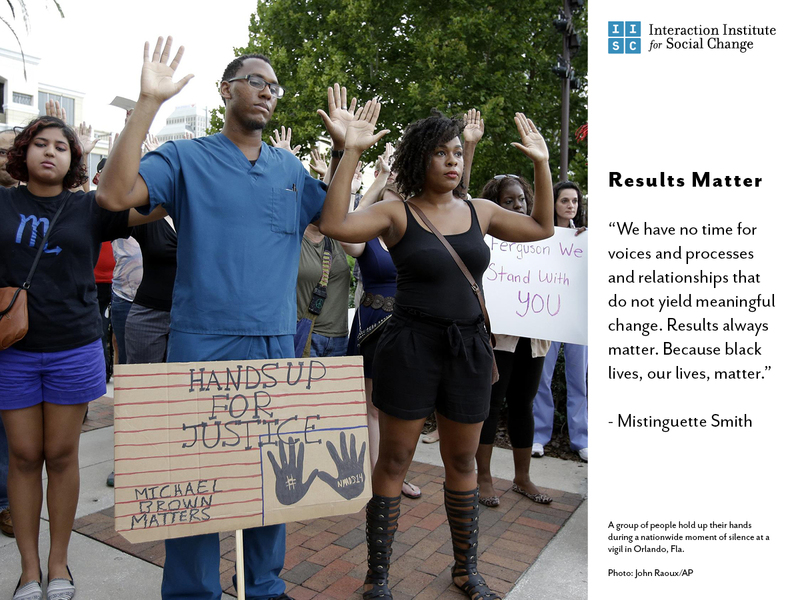 If you listen closely, you can hear our young in Ferguson reminding us: We have no time for voices and processes and relationships that do not yield meaningful change. Results always matter. Because black lives, our lives, matter. Engage for Results . . . I hear you, Mistinguette! I believe the work we do at IISC is a meaningful place in the struggle. And, it is pretty comfortable, relative to young people in the streets. In one way we have failed this generation, but I think it’s only in so far as our efforts have not been effective enough. I’m reminded of the book “Trying Hard isn’t Good Enough.” I think we have to continue trying hard, and as you say, trying hard at the things that will be effective. Thank you for the passionate call. I am persuaded. I want results. How do we get them? Thank you, Mistinguette. I too am persuaded. In the spirit of what you offer, I have been compelled by a mentor to continuously uphold where the people I am working with are in their work, what the end game truly is, and to be honest about lack of progress and “agreements” they/we have made that move us toward/impede just results. This is where some of the visual tools from systems thinking, including the behavior-over-time (BOT) graph, have been very helpful. Would love to talk more as a group of practitioners about how we can hold ourselves and others more accountable. Your call to attend to results, Mistinguette, has never carried more meaning or been more urgent. Thank you, yet again. At tonight’s demonstration I met a woman who’s about our age. Almost her first comment as we stood in front of the South Bay correctional facility was that if our generation hadn’t failed these young people wouldn’t have to be out here doing this. She committed herself to getting more involved. I struggle. I don’t think we have failed. But I do think we didn’t get the full job done. So much more work to do. Van Jones reminded us at Facing Race that we have to concentrate on multiple levers of power-Washington, Hollywood, Wall Street and more. Naming something “failure” can open up the possibility for the radical changes needed. But I also think it’s important to assess progress against the scope of the problem. The depth of racism in this country is the reason 2014 is “a year of insurrection against the state sanctioned murders of young black men.” Not because a generation of freedom fighters failed. Thank you for all you’ve given to all future generations. Thanks, Mistinguette. Racism is of course way, way bigger problem than a one-generation solution can fix. I think it’s really necessary to assess what it is that works. Lately I’ve been confronted by several young people who tell me that demonstrations did not help stop the Viet Nam war- a history that I lived through and understand quite differently than they do.When we have entrenched institutional problems, how is it that we measure progress? It’s not often a quick fix, and how is it we determine what seeds sprout and which just take our energy to plant with no results.